You depend on your car to take you where you need to go. It’s something many of us take for granted every day. That is, until it’s not running or driving right. Auto repairs can be costly and very inconvenient, so we’d all like to avoid them as much as possible. Could your driving style really make a difference? It might not exactly be a “driving style”, but it’s key to keep up with your oil changes. Most people know oil and oil filter changes are important. But, many drive their cars far longer than the proper distance between lube services. As you drive your car, your oil collects tiny metal shavings created by the friction between moving engine parts. Your oil also breaks down more and more over time, reducing its performance. If you don’t keep up with your regular oil changes, you’ll see worse gas mileage, less power, and even serious failures, in extreme cases. It’s best to consult your car’s owner’s manual and your Action Gator Tire mechanic to keep the right oil change interval for your car. That dreaded check-engine light on your dash can light up for a number of reasons. Cars these days have many sensors and computers. These monitor and control engine performance, emissions, and many other key functions. This warning light can be triggered by many issues—some serious, and some as simple as a loose gas cap. It’s all too common for drivers to ignore a check-engine light. Don’t risk it! Your car’s engine or exhaust system may have an issue that’s easy to repair right now yet potentially harmful in the future. It could be a matter of spending a little money today for a simple fix or a large sum later for a more serious problem. Plus, in the meantime, you might have less power or burn more gas. 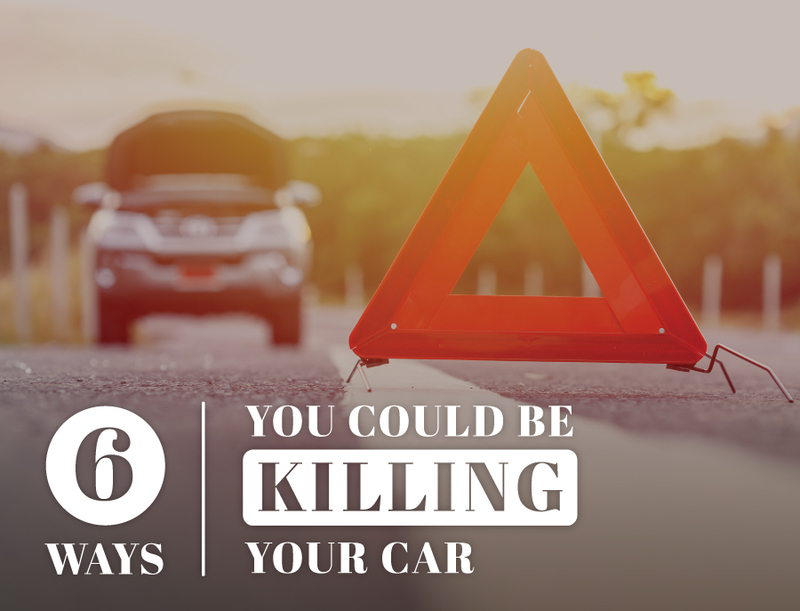 Visit our Check Engine Light page to learn more! One of the easiest bad driving habits to fix is taking turns too quickly. When you drive your car through a corner too fast, you put extra strain on your tires, suspension, steering, brakes, and other parts. You won’t just wear out your tires more quickly. You’ll also shorten the life of key bearings, bushings, ball joints, shocks, struts, steering rack, and more. Why risk these parts you depend on to keep you safe and get you where you need to go every day? All you have to do is slow down and corner at reasonable speeds. Do you wait till the last second to brake at traffic lights or stop signs? Do you have a habit of following cars too closely? Minor changes to your driving habits can make all the difference for your car’s brakes. Next time you see a red light, start coasting earlier and ease on the brakes sooner to come to a gradual stop. That will cause less heat and strain in your brakes. When you’re on the highway, leave plenty of space between you and the car in front of you. That way, you’ll be less likely to need to brake hard if traffic slows down suddenly. These simple habits will cause less wear to your brake pads. Plus, you’ll lower the chances of a warped rotor or other more serious brake issue down the road. If you like to drive with loud music or while talking on the phone all the time, you might miss obvious warning signs. It’s key to listen and feel for any noises, vibrations, or other new signs of a potential problem. Don’t ignore what your car is telling you! Turn down the radio and listen once in a while. If anything sounds or feels different, you could easily do further damage by continuing to drive your car. Instead, bring it into your local Action Gator Tire right away! We’ll make sure everything is good to go. Proper regular maintenance for your car is more than just oil changes. There’s also regular inspections, tire rotations, alignments, filter replacements, and seasonal checkups. They all help ensure your car runs right! Even something as minor as being out-of-alignment can wear your tires faster than normal, costing you money. Avoiding potential extra costs is as simple as keeping up your regular service at Action Gator Tire. Make sure you follow these 6 tips for a reliable, long-lasting ride. If you’re kind to your car, it will be kind to you! With good habits and your trusted experts at Action Gator Tire, you’ll drive with confidence everywhere you go. Feel free to contact your local store if you have questions. Or, you can schedule service with us online any time. We look forward to serving your needs!